Radical preacher Anjem Choudary has been released from police custody after being arrested on suspicion of being a member of a banned terrorist group. He was one of nine men held on Thursday as part of a Met Police inquiry into Islamist-related terrorism. Mr Choudary, 47, was questioned at Southwark Police Station in London. Abu Izzadeen, 39, of London, also known as Trevor Brookes, was charged with breaching a notification requirement under counter-terrorism legislation. He will appear in custody at Westminster Magistrates' Court on Saturday. Mr Choudary is one of eight men, aged between 22 and 51, who have been bailed to return to central London police stations in January. 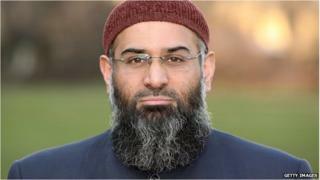 Speaking to the BBC, Mr Choudary said his bail restrictions included a ban on foreign travel and public preaching. He described his arrest as "politically motivated", in order to silence him on the eve of the Parliamentary vote on military intervention in Iraq. Mr Choudary said he had been questioned about organisations that he was formerly involved with before they were banned under terrorism legislation. His brother was released alongside him. Mr Choudary is the former UK head of the Islamist group al-Muhajiroun or Islam4UK, which was banned in 2010. Two men, aged 33 and 42, who were arrested in the early hours of Friday on the M6 motorway near Rugby, remain in custody at a central London police station. Scotland Yard said their officers had searched several residential, business or community premises. Three of the searches are ongoing.